The issue with printers is not that we lack the necessary technology, but rather that the core design and usability issues have not been fully addressed, they have remained the same over the last 25 years. Traditional OEMs improvements end up over-complicating what should be a simple process and producing over-bloated boxes. 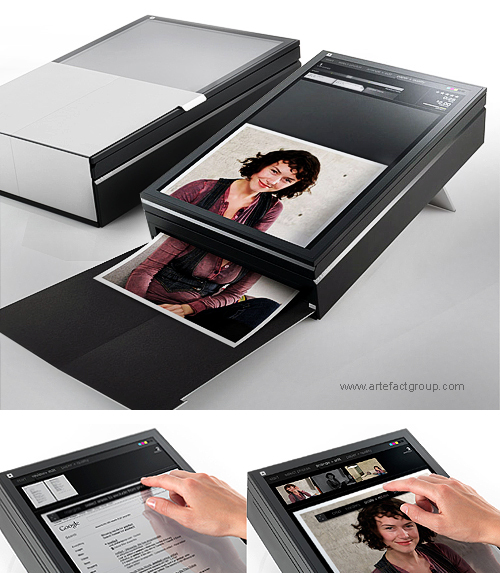 SWYP Printer concept illustrates that it is possible to innovate in very mature and stagnant markets and revitalize a product that has lost its consumer appeal. By showing on the touch-screen exactly what the printed page will look like, it can be radically simple to edit and format the print. Margins and scaling can be easily previewed and edited, just like you would do with the real paper. Color results become predictable with a screen that is always calibrated to the printer. Simplicity also extend to the box itself as the easy access to ink cartridges and the act of opening or closing the lid to turn the printer on or off. When you unfold it, its geometry is such that it becomes a rigid tray.